Windows Tutorials, Howtos, and More! : Use Windows Vista Photo Gallery in full resolution! 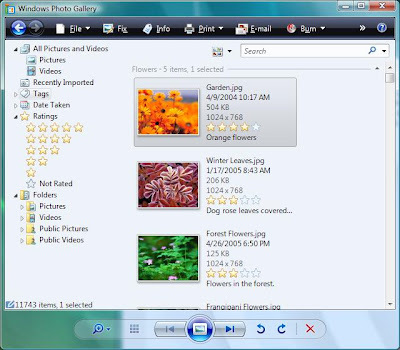 Use Windows Vista Photo Gallery in full resolution! As many people have noticed with Vista, if you do not have an experience rating of at least 5 then Windows Photo Gallery will not run slideshows at high resolutions. This can be a problem, especially for LCD owners because it will not run at the native resolution causing the quality of the slideshow to be heavily degraded. Fortunately, there is a simple fix that requires a little bit of registry editing. Click read more to see how! To fix this nuisance, you will need to open the registry editor. Open the run menu by pressing both the start button on your keyboard and the R key and type in "regedit" and hit enter. Anytime UAC (User Account Control) asks to proceed, hit the permit button. You will need to add an entry into the registry to trick Windows Photo Gallery into believing you have an experience rating of 5. 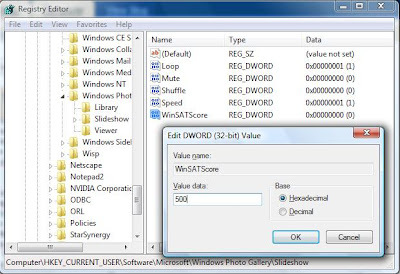 Navigate to "HKEY_Current_User\Software\Microsoft\Windows Photo Gallery\SlideShow" right click in the white space on the right side and create a new DWORD (32-bit) Value named WinSATScore. Double click the entry you just created and enter 500 for the Value Data and hit OK. Your Windows Photo Gallery should no longer change your resolution when you start a slideshow. You may have to do this for every user account on the computer and Windows Photo Gallery may not run fluidly if you do not have a experience rating of 5.